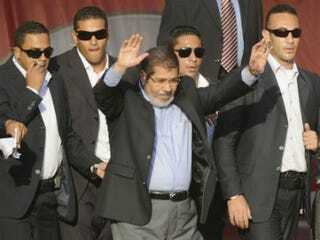 On Friday, Mohamed Morsi was officially sworn in as Egypt's first elected president, in Cairo's Tahrir Square. Last week, Morsi was declared the winner of the country's highly contested first democratic election, during which his chief opponent was Ahmed Shafik, according to the Guardian. Morsi was the candidate of the Muslim Brotherhood. The swearing-in location in Tahrir Square was symbolic, as it was the origin of the country's revolutionary riots, which overthrew former President Hosni Mubarak. Morsi is Egypt's fifth head of state since the overthrow of the monarchy some 60 years ago. "We aspire to a better tomorrow, a new Egypt and a second republic," Morsi told the judges of the court during a solemn ceremony shown live on state television. "Today, the Egyptian people laid the foundation of a new life of absolute freedom, a genuine democracy and stability," said Morsi, a 60-year-old US-trained engineer.